1544 CHESTER William, Sir ? for sugar brokers in Gt Tower St.
part counting houses on the lower floors and five showrooms above." spices and the rest, with up to 150 potential bidders 'all armed with catalogues and pens'." One of the many Offices & Sale Rooms in Mincing Lane is shown left, however for a picture of the Commercial Sale Rooms, click here, then enter 5270 into the search box. CLICK the for sugar houses in that street, and on for an image. The length of this map represents 1.2ml / 2km. Where were the Sugar Brokers & Sugar Coopers ?? This is a short history of a small sugar refining concern, with a slight difference, that ran for at least 116 years and spanned four generations of the same family. It began in the heart of the City of London in the first decade of the 19th century and was sold/closed by the family soon after 1923. It didn't make sugar loaves like most sugarhouses, but produced liquid refined sugar ... capillaire and spirit colour ... and continued in business long after almost every one of its contemporaries had foundered. John Smith - "came from Cheshire, his family were famous in the Vale Royal and he was, I believe, the youngest of 19",(2) ... probably Tarporley. (3) As yet no further details of when he arrived in London. It's assumed to be prior to 1780, for his granddaughter Maria writes in her 'memories', "I remember hearing that he [John] was out in the Gordon riots in 1780 and somewhere in the house of my grandmother kept his buff coat by way of family heirloom � but I never saw it. "(1) John Smith married Margaret Alice Bedell at St Anne Soho, London, in 1790. Their first child, Ann Simm Smith, was baptised at St Martin in the Fields in May 1791 and buried on the first day of the following year at St George the Martyr, Southwark, the Bedell family church. The 7 children that followed, the last being Charles in 1806, were all baptised at St Michael Queenhithe implying that by the end of 1792 this was where John was living and working. 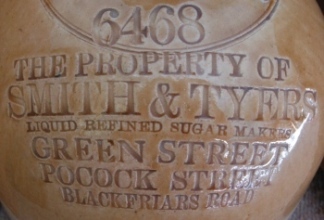 Directories show that from 1807 through to his death in 1832, John was a sugar refiner & capillaire maker of 50 Upper Thames St, in partnership with Brown in 1811, and in the latter years the company name was Smith & Son. 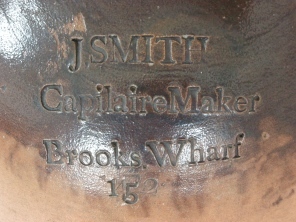 An early John Smith flagon was inscribed Brooks Wharf. Capillaire was a water-clear syrup originally flavoured with dried maidenhair fern though later with orange-flower water, much used by confectioners as a flavouring, and also as a cordial. In the theatre advertisements on the front of The Times the sale of capillaire as a refreshment was often mentioned. It was son Charles whom John had taken into business, and in his will of 1832 he left him the goodwill of his business as Sugar Refiner and all the plant, stock etc belonging to it. He asked his widow, as executrix, to lend Charles �500 at lawful interest for the purpose of carrying on the business on his own behalf. John Smith was buried at St Michael Queenhithe, however his address is given as 10 High Timber St, a house that stood at the top of Brooks Wharf and adjoined the rear of 50 Upper Thames St. Margaret Alice Smith died in 1841. Spirit colour was developed as a colouring for rum ... a boiled dark muscovado sugar with a small amount of rum added was produced, and about 3 pints would colour 100 gallons of spirit. 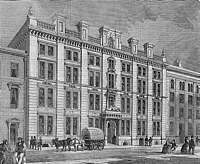 By 1838 Charles had moved the business across the road to 203 Upper Thames St, between the church of St Mary Somerset and Fye-foot Lane - a large house with premises to the rear that had previously been a cooperage, for the refining. He had married Sophia Ann Hill, with whom he had 11 children. The first, Sophia Margaret, was baptised in 1835 at St Michael Queenhithe while the family were still living at 10 High Timber St; the second, Kate Anne, in 1836 at St Mary Somerset; the following eight, all born whilst the family was at 203 Upper Thames St, were again baptised at St Michael Queenhithe. 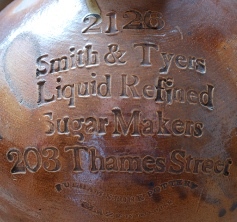 In 1840 Charles went into partnership with Robert Tyers under the name of Smith & Tyers Liquid Sugar Refiners, though they continued their other lines of business. 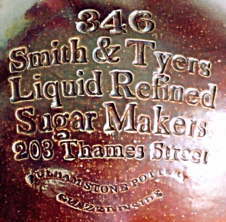 Tyers appears in 1841 to also have had a fish sauce warehouse at 58 Borough High St.(5) By 1853 Smith & Tyers, sugar refiners, colour manufacturers & vinegar and pickle makers, had moved from Upper Thames St (possibly the last of the refiners to move out of the City, something that had been ordered around the turn of the century) to 14 Green St, Wellington St, Blackfriars Rd, Southwark, and by 1855 the Smith family had moved to Church House, Newington. Charles and Sophia's eleventh and last child's baptism took place at St Mary, Newington, however, sadly the day upon which Sidney William was born was also the day his mother died. Robert John Tyers - the son of John & Elizabeth Tyers was born in April 1802 in Wimpole St and baptised at St Mary Marylebone. He married Mary Mallyon of Goudhurst, Kent, at nearby Pembury in 1829 ... I can find no children for the marriage. In 1841 Robert is listed as a sugar refiner(5) living with his wife in Gibson's Hill, Norwood, as well as running a fish sauce warehouse at 58 Borough High St. By 1851 he'd moved to the Kent border and was living in West Wickham. Robert Tyers died 15 Sep 1866 at West Wickham. His will was proved 21 Nov 1866, simply leaving all his estate to his widow, with no mention of the business. By this time, Charles Smith had taken his second son Frederick Henry Smith into the business, and so it was continued without interruption when Charles died on 11 Sep 1873, his residence being given as 18 Grove Hill Terrace, Grove Lane, Camberwell. His will was proved 14 Nov 1873 with the business being left to Frederick, and the rest of his estate divided amongst his immediate family. Within a few months of the death of his partner, Robert Tyers, Charles and Frederick H Smith settled with Mary Tyers regarding the business of Smith & Tyers. One aspect of that indenture is recorded in Charles Smith's will - that Smith & Tyers pay Mary Tyers an annuity of �125 for her natural life. Mary died in 1885 at Hastings. 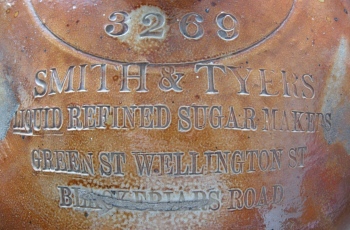 Frederick Henry Smith - the son of Charles Smith, born 1841, and brought into the business well before the death of Robert Tyers. I would think he had to prove himself and his commitment to Smith & Tyers in order to be party to the indenture regarding Mary Tyers in 1867. He married Helen Mary Christian in 1867 and they had a daughter and two sons. 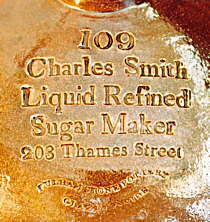 Clearly the emphasis of the company changed during the time of Frederick Smith, for his father had always styled himself sugar refiner, as had Frederick himself in the 1871 census, however in 1881 he was a compounder and sugar refiner employing 11 men, and in the new century he was a (licensed) rectifier and compounder, emphasising the mixing of spirits rather than sugar refining even though the trade directories of both 1895 and 1915 listed Smith & Tyers under Sugar Refiners. Only small amounts of spirit colour were required for mixing with large quantities of spirits, so it's possible that refining was reduced to the absolute minimum or they even bought in the spirit colour in the latter years. The family home was 15 Tyson Road, Forest Hill. When old enough, Frederick's second son Lionel entered the business as a rectifier and compounder and when Frederick H Smith died in 1923 his will stated that Lionel should be given an option to take over the business. In his will Frederick also bequeathed his grandfather's (John Smith) wardrobe to his eldest son, Frederick Charles Smith a solicitor. 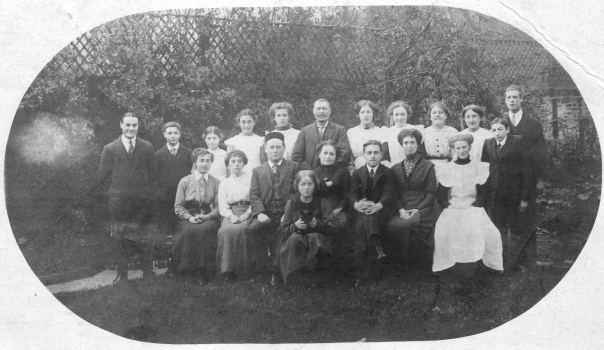 Lionel Corlett Smith - born 1882, son of Frederick Henry Smith, educated in Hastings, worked with his father at Smith & Tyers. He married Ethel Reid in 1910 and they had two children. When his father died, Lionel was given the option of continuing the business as his own, which it seems he did, but for how long I don't yet know ... he's listed as a "compounder and rectifier retired" in the 1939 register. He died in 1967. So, Lionel was one of the great grandchildren of John Smith sugar refiner and capillaire maker, as was his cousin C Aubrey Smith 1863-1948, the England cricketer and Holywood actor, and the poet Gerard Manley Hopkins 1844-1889, the son of the aforementioned Kate Smith. photograph c1909, from postcard dated 1913 - � christopher cobb 2014.
and Green St was renamed Rushworth St.
1. Early Memories March 1883, by Maria Giberne nee Smith. Unpublished. �Christopher Cobb 2014. 2. The Mirror, by Kate Hopkins nee Smith. Unpublished. �Christopher Cobb 2014. 3. From notes from Edward Smith, brother of Kate & Maria. �Christopher Cobb 2014. 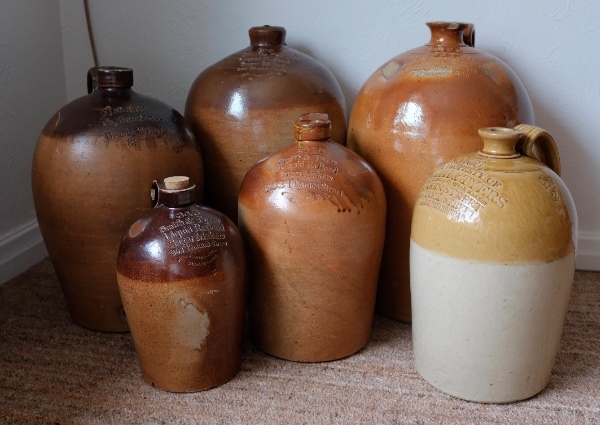 All flagon images � Bryan Mawer 2004-2018. Capillaire page, with full details of the flagons. My thanks to Christopher Cobb, 3xgt grandson of John Smith, for his invaluable help with this short history. He would like to acknowledge his Gt Aunt Kate Hurlbatt from whom he inherited the extracts from the reminiscences of childhood by Kate & Maria by way of his Grandfather and his Mother. "Kate was the eldest grandchild of Charles Smith sugar refiner, and daughter of Sophia Margaret who married Charles Hurlbatt in 1862. Kate (I guess named after her Aunt) was born in 1865 so it is very likely that she may have known her Grandfather, albeit her parents seemed to have lived in Cheshire. She never married and became Superintendent of Aberdare Hall, a Woman's College in Cardiff. Her two brothers were killed in WWI. But for Kate Hurlbatt we would never have known these fragments about 1830 era London."